Using a soft touch generally no greater than 5 grams, or about the weight of a nickel, practitioners release restrictions in the craniosacral system to improve the functioning of the central nervous system. Clients remain clothed in loose comfortable clothing of their own during the session. 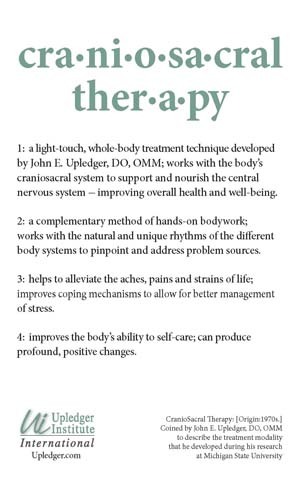 CST was pioneered and developed by osteopathic physician John E. Upledger (www.upledger.com) following extensive scientific studies from 1975 to 1983 at Michigan State University, where he served as a clinical researcher and Professor of Biomechanics. "My physical therapist recommended the work of CranioSacral Therapy to me and specifically therapist Dominique Tardif. The use of massage as part of my complement of health care providers has been in play for the last 15 years. However, as I started to get more acute and cascading symptoms from an injury that were curtailing my quality of life, I am grateful to have had Dominque as part of the team of health providers that have worked together. She has a wide array of techniqes and both clinical and intuitive knowledge and skills. Techniques Certified with the Upledger Institute. © Copyright 2019 Healing Arts Boise LLC. All rights reserved.